The Specs: Technology in climbing rope manufacturing has taken leaps and bounds in the last 10 years. Where 11 mm diameter ropes were once (not too long ago) the standard, now rope manufacturers are able to make skinnier and skinnier ropes without much compromise in strength. Thin cords are definitely the new standard and Sterling Rope's Nano 9.2mm is the cream of the crop. They have created this rope as an ultra light red-point rope, that can still handle 6 UIAA falls. In Sterling's case, they actually round down to be extra safe for their fall ratings; In one of three tests the Nano actually held 8 UIAA falls. With an impact force of 8.4KN, the Nano guarantees a soft catch. And at a measly 53 grams per meter, a 70 meter Nano will likely weigh in lighter than your 60 meter 9.8mm. The Rope: This cord is skinny. It will take a while to get used to handling it, both for the belayer and the climber. After you get used to clipping or belaying with this thing, you will be hooked. Right away you will notice how small the rope packs down, and the drastic difference in your pack weight. The sheath holds up to some serious abuse as well, with my 70 meter showing no signs of wear after over a year of moderate use. This rope actually gets a lower impact force rating than some of Sterling's larger ropes so you can expect an ultra soft catch if you happen to pitch from your project. I use one as a red-point rope, and recently I have been putting another one to the test as an indoor rope as well - I can't get enough. I've heard rumors that a 70 meter Nano is the best alpine single rope option, as well as rumors of doubling up 60m Nanos for an ultra burly half rope. It comes in three lengths and two mega-bright colors. Overall: Don't be intimidated by the skinny cord. When first belaying with a skinny, I would suggest beginning by using a Petzl Freino belay biner if you'd like (for added friction when lowering), or simply use gloves. The Nano is as strong or quite possibly stronger than your 9.8mm, so don't let the thinness fool you. The Sterling Nano 9.2mm will pack smaller, weigh much less and handle better than you had ever thought possible, so don't be scared, go skinny. Being a recovering addict I found this article very helpful. I was looking for intervention help and came across many places that gave me the guidance I needed. Don’t let addiction take over your life. You can get eating disorder rehab today. Turn to someone who can help. 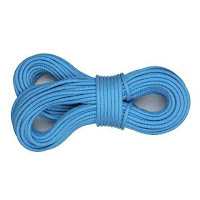 i recently bought this rope and im a little scared of the use of this rope, why cant i make top rope? its my first rope but i actually making redpoints and onsights but i dont understand the problem with the top rope and, its a good rope for gyms???? dont get problems with the friction? im sorry for my poor english, ahaha. When I needed to find a California treatment centers these guys made the difference. They gave me the help I needed and it made a big difference for the rest of my life. 4 years sober!